Geordie Williamson, who has been Advanced Researcher at MPIM from 2011-2016, is the youngest living scientists to become a member of the Royal Society. Geordie Williamson works in Representation Theory. He has made several fundamental contributions to the field including his proof (with Ben Elias) of the Kazhdan-Lusztig positivity conjecture, his algebraic proof of the Jantzen conjectures, and his discovery of counter-examples to the generally suspected limits of the Lusztig conjecture in modular representation theory. 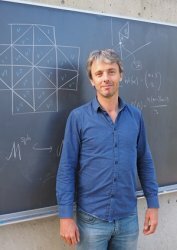 For his work he has been awarded the Chevalley Prize of the American Mathematical Society, the European Mathematics Society Prize, the Clay Research Award and the New Horizons Prize in Mathematics (with Ben Elias). In 2018 he will address the International Congress of Mathematicians as a plenary speaker. Geordie is currently Professor of Mathematics at the University of Sydney. Prior to coming to Sydney he spent five years as an Advanced Researcher at the Max Planck Institute in Bonn. In 2020 he will lead a special year on Representation Theory at the Institute for Advanced Study in Princeton. The Royal Society, founded in 1660 by King Charles II, is the oldest scientific institution of its kind in the world. The Fellows are the basic members of the society, who are themselves elected by existing Fellows. As of 2016, there are about 1,600 fellows, allowed to use the title FRS (Fellow of the Royal Society), with up to 52 new fellows appointed each year.